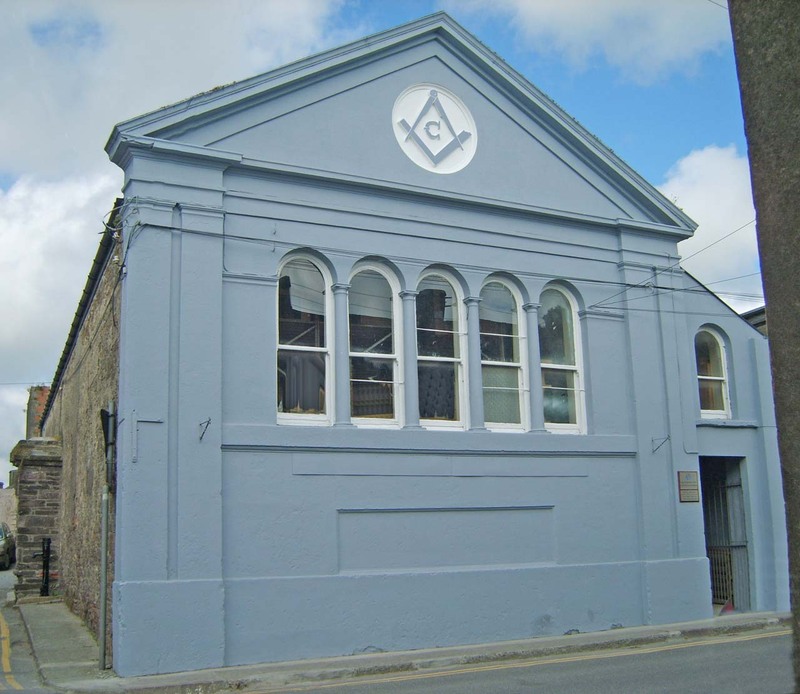 Welcome to the web page of the Fifteenth Lodge of Ireland, Skibbereen. Freemasonry flourished in Ireland in the 1730s and it is believed that the original warrant No.15 was issued for use in Gorey, Co.Wexford, most likely during 1732. The lodge seems to have met in that town until 1801, but records have been lost; the warrant was revived in 1807, for Cork, but seems not to have been taken up until 1817, when a meeting held in Cork was adjourned to meet in the town of Ross Carbery, then a garrison station in West Cork. This warrant was in turn moved to Skibbereen by Order of Grand Lodge on April 7 1842. The Lodge met initially in the premises of Bro. Frederick P.E. Potter, a member of the Lodge, which was at that time the official stopping place of the stagecoach to Cork from western districts, and was subsequently named The Eldon Hotel after Mr Potter’s son, Eldon. At some time the Brethren also met in rooms rented from a Mrs Doyle. Mr Potter was also the proprietor of The West Carbery Eagle newspaper, subsequently known as The Skibbereen Eagle, and which is now incorporated into The Southern Star, still the West Cork regional newspaper. In 1860, the Brethren started to think about the construction of a suitable building of their own. About 1863, a large Lecture Hall had been built in Mardyke Street for the holding of public meetings; an important lecture was held there on October 7 1863, organized by the Skibbereen Literary and Scientific Society, incorporating a demonstration of the Magnetic Telegraph, when messages from Cork city were printed out during the course of the evening by Bro. Potter. Perhaps the use of the lecture hall premises was somewhat less successful than intended and, in July 1869, it was agreed that Fifteenth Lodge of Ireland purchase it from James Hutchinson Swanton for £250. Obviously renovations and alterations had to be undertaken and the Lodge finally met in March 1870 in the present building. The architect in charge at the time was Richard Lee, of No.7 North Main Street, Skibbereen, who was also a member. The downstairs lecture hall facility was preserved for its original intended use, including a public gallery, and has seen use as a badminton hall, drill facility for the Irish military reserve, and storage facility for a local firm (as presently); kitchen facilities were installed downstairs, so the venue could be let out to generate income and also to be available for catering at the annual installation dinners: the offices presently comprise the Skibbereen branch office of the department of Social Welfare; the meeting room for both lodge and royal arch chapter was upstairs at the rear of the building, where it has since remained. The interior of our meeting room is hand decorated with symbols and stencil work, in a style that is unique in Irish Masonic Halls. In 1950, some decay was found in the premises in the form of wet and dry rot, which necessitated an appeal to all lodges in the Irish Constitution. Aside from these repairs, no substantial work had been carried out since 1870, until fate intervened on the evening of April 9 2006, when a fire at the adjacent former Methodist Church – subsequently converted to a restaurant – spread to our premises. The damage caused by the fire extended to the entire roof structure, but below that level was thankfully limited to that caused by smoke, water and fallen debris. The members of the Skibbereen and Schull fire brigades, assisted by one of the Skibbereen Brethren who was passing at the time – and at not insignificant risk to themselves – managed to move all of the Lodge property and furnishings to the ante room, where they were preserved for subsequent restoration. Fortunately all of the records and minute books, being stored in a steel safe, were saved. 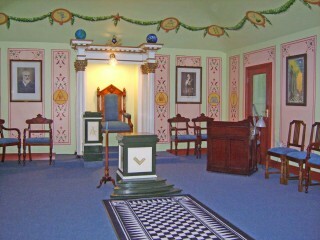 The walls and ceiling of the lodge room had unique hand painted decoration and stencil work, and contained thirty-two Masonic icons, symbols and relevant Biblical scenes. Enough remained of all but one of these so that a photographic record could be made before all the plaster had to be removed prior to reconstruction. The centrepiece of the ceiling was a magnificent stained glass panel 12 feet by 6 feet displaying Masonic symbols, and this was totally destroyed as the burning roof fell down through it. Immediately after the fire, the members formed a committee, and set about drawing up an insurance claim. An inventory was made of everything that was lost or damaged and the committee set about finding sources for replacement and restoration. We were very pleased that all of the work of restoration could be carried out by craftspeople living locally and we received much sympathy and encouragement from the people of Skibbereen. Our thanks are due also to FBD Insurance, without whose support, no restoration would have been possible. The restoration of the building was carried out under the supervision of John Collins, Architect, by Dan McCarthy (Builders) and his sub contractors. This work entailed the dismantling and replacement of the entire roof structure and extensive repairs and re-plastering of the interior, including restoring the ground floor area occupied by our two tenants. The work of restoring the unique hand painted murals in the meeting room itself was carried out by Nigel Connell from Drimoleague, assisted by his wife Louise, who also beautifully restored the gilding of the frames of two portraits of past masters of the Lodge. One of these is of Dr David Hadden, who would have been well known as a local medical doctor in the town in the 1860s, and whose great-grandson of the same name is Hon. Professor of Endrocrinology at Queen’s University, Belfast. Brigitte Shellswell-White, Bantry House, restored the oil portraits themselves. 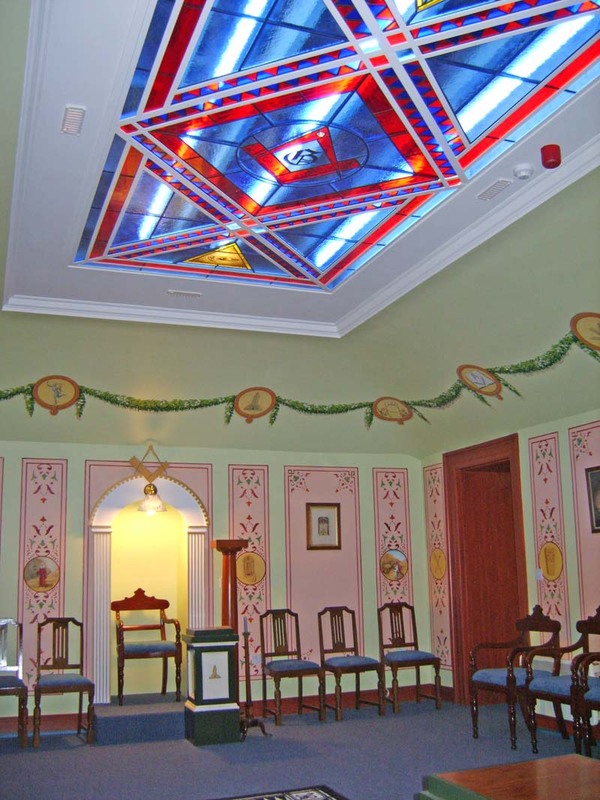 A unique feature of the lodge room had been the stained glass panel in the ceiling, supported on timber frames. Nothing at all remained of this, and the only record had been a video made by one of our members some years ago, which only showed superficial details. It was necessary to re-design it, and it was decided to do this by making a steel frame, which was fabricated by Pat O’Driscoll, Ironworks, Drimoleague. The leaded stained glass panel was created by Methuselah Stained Glass, Drimoleague. This involved resolving special technical difficulties, as leaded stained glass panels are specifically designed to be placed vertically in church windows, and not horizontally in a ceiling. The furniture was restored by Matt Clarke at SOS Upholstery, Skibbereen, who took a special interest in restoring the Warden’s Chair, which following Masonic tradition has a canopy over it; when the damaged fabric covering was removed, some ancient Masonic decoration was revealed. 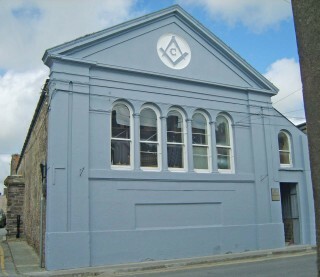 The Masonic Hall had a Public Open Day on Sunday September 23 2007, from 12 noon until 6 p.m., with entry free of charge. The event was an outstanding success, with over 400 members of the public visiting during these few hours. A voluntary collection raised funds, which were distributed between the local branches of St Vincent de Paul, Co-Action and Cope Foundation. 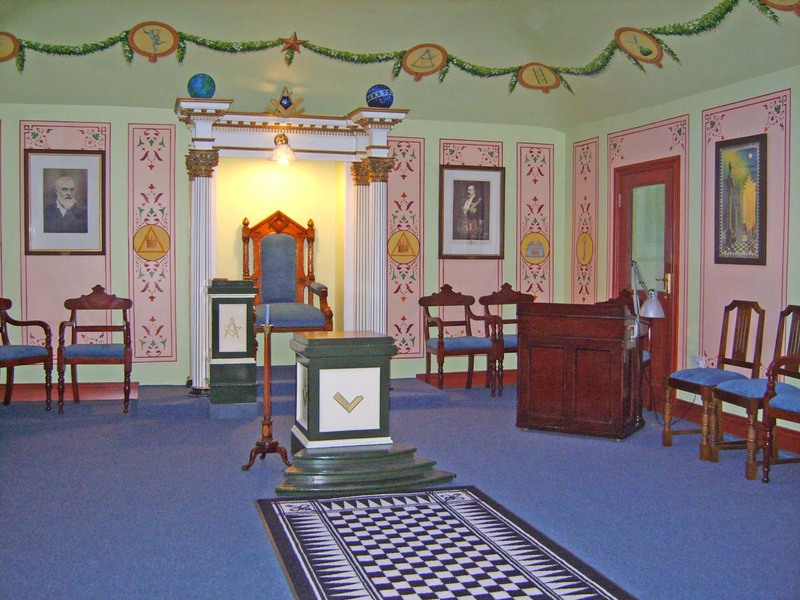 The Masonic Hall was officially rededicated by the M.W. The Grand Master of Ireland, George Dunlop, on 4 October 2007. Enquiries from potential new members are always appreciated. A new warrant was issued 12 July 1807 to CORK, in lieu of a Seton issue, where it met for ten years before removing to ROSSCARBERY, Co. Cork, 27 December 1817, which was a military station. No. 15 warrant moved to its present location, SKIBBEREEN, on 7 April 1842, where its first recorded meeting took place on 28 April 1842.